While the chicken was cooking, I made the quick blender sauce of buttermilk, a hunk of good Parmesan, garlic, and a handful of kale. It comes together in a flash. You can either toss the zoodles with it or use it in a more conventional way. Sounds like such a lovely party and I’m looking forward to making the Kale Buttermilk Dressing. I can see why it was the star of the party and again the next day. I’m so having this for lunch today! You are just great, Ali!! 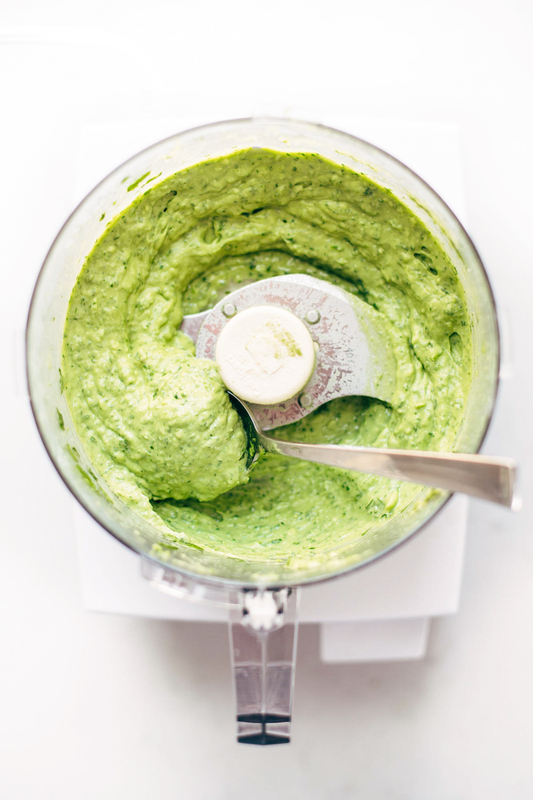 I am going to try that Kale Buttermilk dressing next week – but I may put it over beet noodles! I would just love this salad. 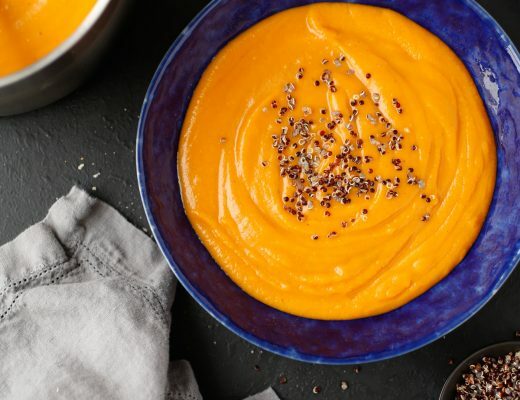 It looks so amazing–and that dressing? Yum! It sounds like you had a fun party! This salad looks amazing and I bet everyone at the party LOVED it! I know I would have! I could use that dressing on so many different things. It looks delicious. I’ve decided I need to bookmark your entire site. It sounds like a lovely get together and that salad looks DELICIOUS!! I love anything with lemon, especially when chicken is involved, so this is right up my street! 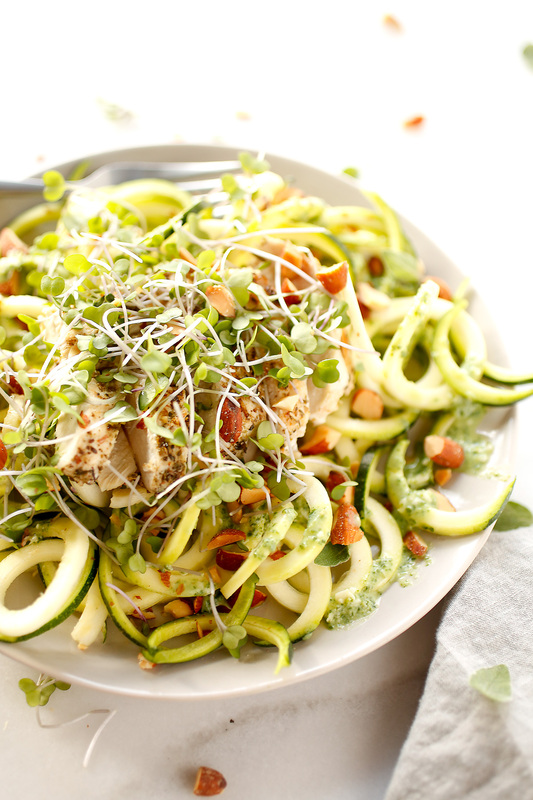 This looks like a delicious & healthy chicken salad recipe. 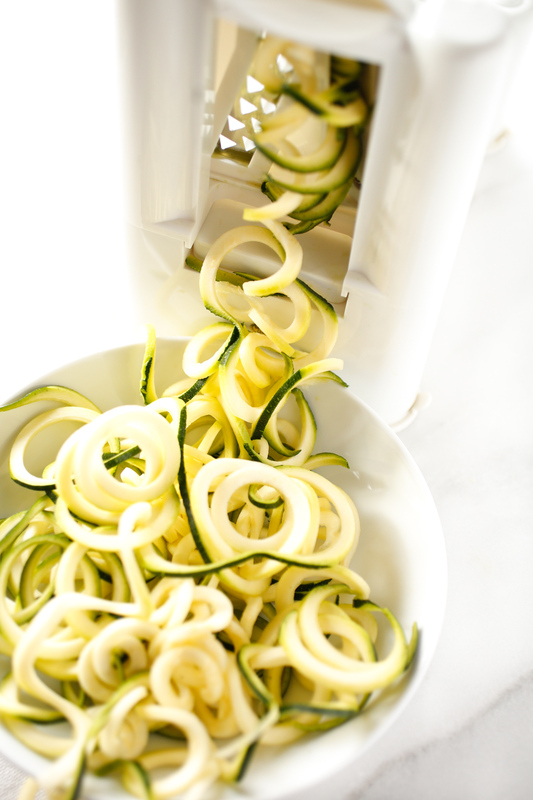 Reminds me to dig out my spiralizer to make some good zoodles & sauce. 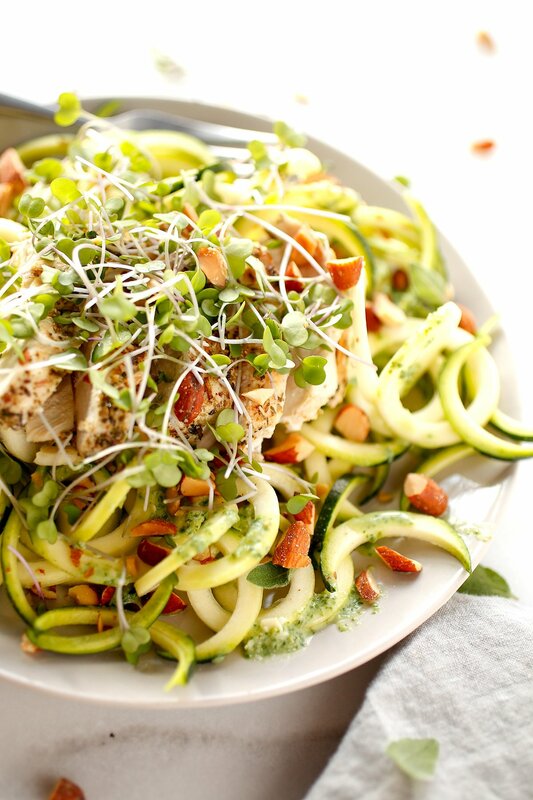 We love zucchini noodles in our home. I stopped eating traditional pasta about a year ago. I’ve had traditional noodles once since that time and it messed my stomach up! My husband will only eat his cooked, though. I’ve heard ostensibly used in a sentence before but never bothered to look it up. Good news is your description with it made it unnecessary to do so. Great post! This dish looks so yummy! While usually this time of the year I am elbows deep in chili our weather has been so back and forth, some days like spring, this is perfect for those days! I love lemon chicken and I do love anything with buttermilk so this sounds perfect! HOLY MOLY! I can’t wait to make this. I don’t think I’ve ever had lemon chicken. What a great weeknight meal. Light but substantial. Your photos always make everything look drool-worthy. . . yum! Wow! Looks interesting – this seems yummy and delicious too – At home we so love zucchini noodles, whether cook or not we’re on it. And I like that my nieces love this too as this saves them from carbs from common pasta. A good salad is like a breath of fresh air. It’s the perfect addition to any party. And the buttermilk dressing is going on my To-Make list this weekend! 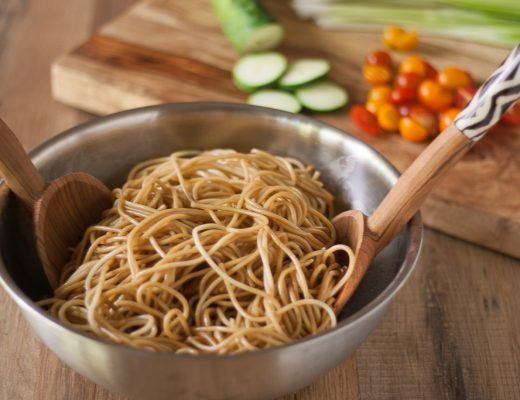 We tried doing the spirialized veggie “pasta” a few weeks ago for the first time. Surprisingly my whole family really loved the dish we made. My son commented that it was more like a salad than a pasta dish but everyone loved it. I love blogs that post amazing salad recipes. It’s soooo easy to fall into the rut of just throwing some lettuce into a bowl with a couple of cherry tomatoes and some store-bought dressing. Posts like this remind us of what a salad SHOULD be like – diverse, delicious and anything but boring! I am always looking for new healthier recipes to try. I will have to pick up the ingredients I need to make this on the weekend. It looks so delicious. This looks delicious! Surprisingly I’ve never tried Zucchini noodles before although all of the vegetarian raw sites rave over how its the perfect pasta alternative. Thanks for the reminder to try this as soon as possible. I made this last night for dinner. It turned out wonderfully–and tasted even better. We especially loved the dressing. Your recipes never disappoint and if I’m not sure what to cook, I browse your site and always come up with a great idea! Oh it sounds like you must of had such a fun time with your neighbors! Aren’t those just the best kinds of nights? Nothing but laughs, chats and good food! This recipe looks SO amazing. 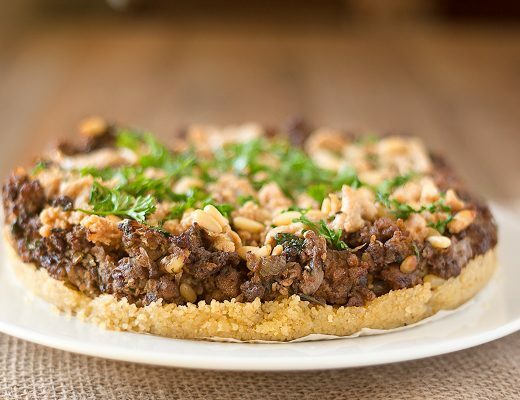 I definitely will be trying this out – I love this mix of flavors too. Nothing quite better! 😉 YUM! Just wanted to say thanks, Ali. 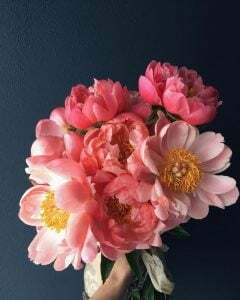 A few months ago, a friend introduced me to your blog and I’ve become a big fan. The food is fantastic, but your writing helps get me through bad days at my frustrating job. So thanks and keep up the great work! It sounds like it was an amazing party. I love i individual pot pies at parties. Such a great idea! Ali, this is exactly why you are my go-to girl! I needed something relatively fast and simple for dinner and remembered seeing this. It was delightful. The chicken just lemony enough. And the kale buttermilk dressing was perfect with it. I had mine with the zoodles and made regular spaghetti noodles for my hubby. Oh, my! Ali, I just wanted to say that I love your blog. I’ve been reading it for a little over a month now and it’s great! I love photography and food so this is right up my alley. I’ve never made lemon chicken but I just made homemade dressing last week. You’ve inspired me to go for it! Your writing Ali, really adds the loveliest touch, in multitudes. And thanks so much for the Walt Witman quote. I’m filing this recipe away for when spring returns. 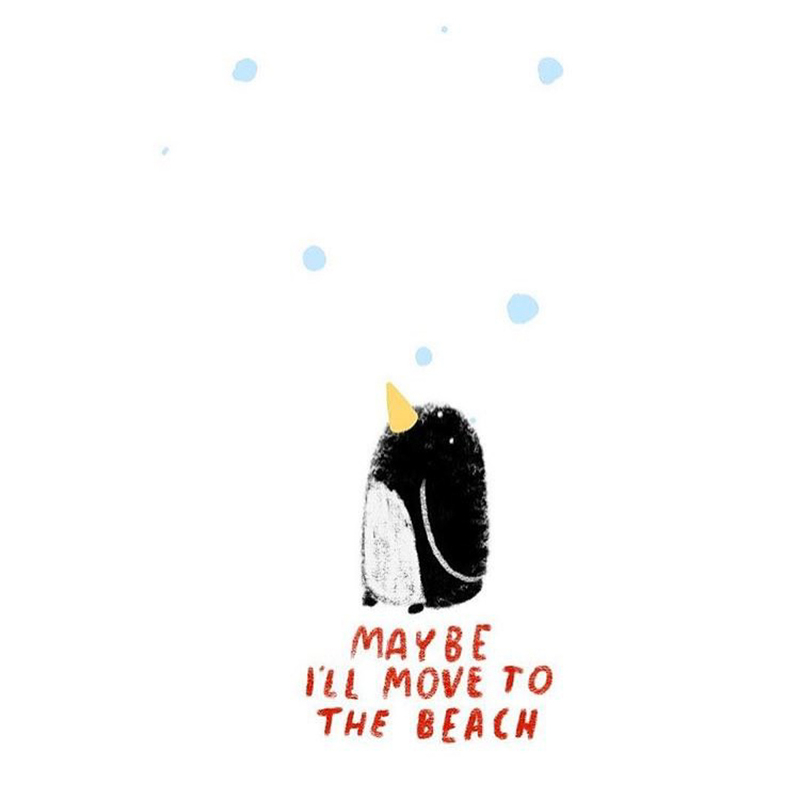 but am guessing it won’t wait and I’ll make it the next time there’s a sunny day ’round here. Oh my I need neighbours like this, mine just does frozen pizzas or hotdogs when we go over…this sounds Devine. That sounds like an amazing party!! I would love to have seen the tree! My salads are so boring. I’m glad you shared this! It’s time to try something new for sure! Glad your husband finally got well enough and was able to join you!! I don’t think you are fickle. You just have things that strike you at certain times as interesting or different. Or you like taking things in another direction. I think that we all have things we like, but we still like to try new things from time to time. I hate doing the same thing over and over. This year I’ve become such a fan of zoodles. I don’t cook mine either as I find when you put a warm sauce over them they soften perfectly as they are. LOVE the sound of this dressing! And I want to go to one of your neighbour’s parties – it sounds amazing! This salad looks incredible. 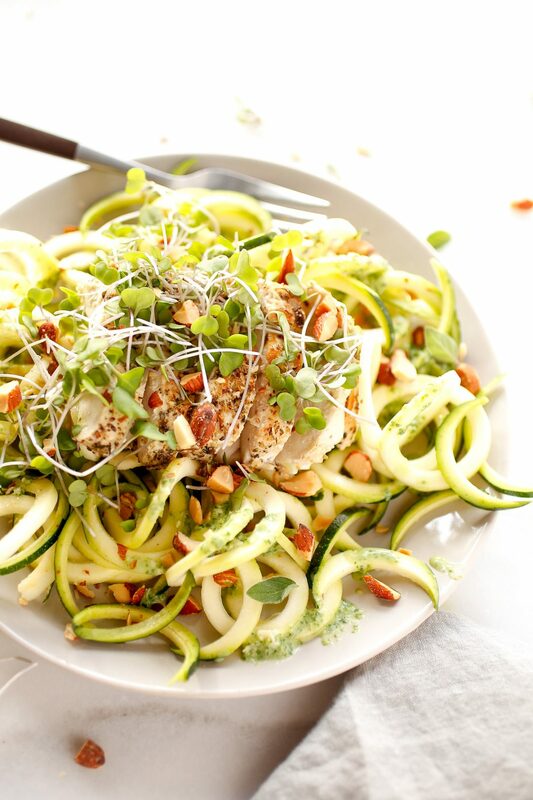 I love zoodles and am a big fan of herb and lemon chicken so this sounds like the perfect lunch to me. Totally intrigued by the dressing too, would never have thought to use kale and buttermilk together to make a dressing but it sounds delicious! Oh I have been after new recipes as I’ve started taking lunch to work & I think this will be next on my list! Ali, this is exactly why you are my go-to girl! I needed something relatively fast and simple for Sunday dinner and remembered seeing this. It was delightful! Just lemony enough. The kale and buttermilk dressing is perfect with it. For my hubby, I served it with brown rice and also a mix of chopped squash, zucchini, and caramelized onions. Oh, my! So, so good! This sounds like it was a yummy night, from decor to food. My dad makes a dip similar to the buttermilk dressing and we dip the leaves of grilled artichokes in it, which is just wonderful. Ooh I’m saving this recipe for January – perfect for kickstarting my healthy eating, although I’ll miss out the chicken because I’m veggie! Sounds so delicious, Ali. A dressing that sounds similar to a spread we enjoyed during the sunny days this past weekend. Salmon burgers with avocado and kale mayo. They were so good!